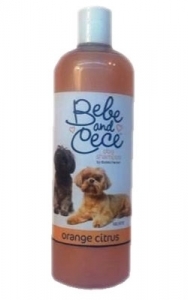 Home » Grooming » Shampoos & Conditioners » Bebe & Cece™ - Orange Citrus - 16 oz. Bebe & Cece™ - Orange Citrus - 16 oz. Orange Citrus - Revitalizes skin and fur as it gently cleans; leaving your pet shiny, soft and smelling as sweet as a sunny citrus grove! 16 oz. Tags: Bebe & Cece™ - Orange Citrus - 16 oz.